I don’t know which is more satisfying: feeling full with good vibes after eating this green pea soup, or quieting the skeptics who don’t believe protein comes from anything besides animals. 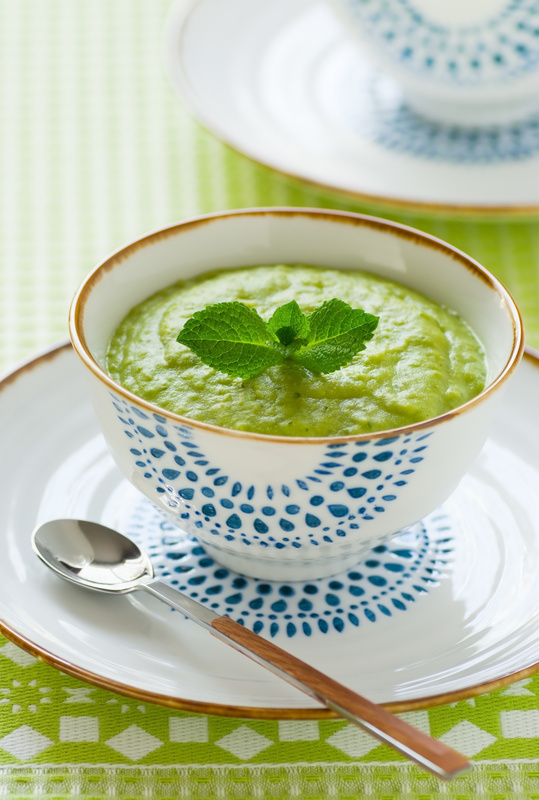 Between the green peas and beans, this soup is protein central — vegan and cruelty-free!! This is one of my favorite soups to make for one specific reason: it's ridiculously easy. It’s so easy in fact, you won't believe it! It’s bright green and deliciously filling, yet it’s fresh and light at the same time. I got the original recipe from my friend and inspiration for all things food, Ella Mills. You may know her as Deliciously Ella. Listen to her personal story of how she healed severe illness with food, “Are We What We Eat? With Ella Mills” on my podcast while you cook up this yummy soup! I had to tweak her recipe a bit because I couldn't find the ingredients needed here in Aruba; when you live on a Caribbean island, you have to work with what you've got! Ella's recipe calls for cannellini beans, but I couldn't find any so I substituted with navy beans. It totally worked! For all those people that ask us vegans, “But where do you get your protein?” tell them you get tons of clean, cruelty-free protein from this soup’s main ingredient: green peas! Peas are PACKED with protein. Plus, they contain antioxidants, anti-inflammatories, fiber, omega-3, they promote healthy vision, and get this — peas nourish the soil that grows them by adding nitrogen and decreasing the need for fertilizer. Green peas for president! amino acids, the essential building blocks of protein, from the Bragg’s Liquid Aminos. Pour the peas and the vegetable stock in a pot and heat slowly. Wait for the peas and veggie stock to begin to boil (about 10 minutes), then take the pot off the heat. Add the navy beans and mint leaves (not the sprigs). Use a hand blender to blend it all together until the soup is creamy and smooth. If you don't have a hand blender, you can transfer everything to a regular blender a bit at a time to mix. When everything is blended, put the pot back on the stove bring the soup back to the stove to heat, adding salt and pepper to taste. I added a dash of Bragg's Liquid Aminos at the end for extra flavor, but a tiny splash of soy sauce will do, too! Garnish with a few mint leaves, serve and enjoy. Want to experiment in the kitchen with more easy and nutritious recipes? Scroll through our Food section above and check out Nourish on oneOeight.com. Tell me how your pea soup turns out! Do you have another favorite soup recipe? Share it with us below! May this meal nourish your peaceful heart. Om shanti, shanti, shanti.